Thursday night’s performance by the Thompson Twins’ Tom Bailey, B52s and Culture Club demonstrated not only can you survive the 80s but you can thrive well after the decade is gone. Synthesizer soaked with the stage showered in blue, the Thompson Twins opened the lineup donned in all white suits as the crowd clapped along to the chorus line “Doctor, Doctor.” Their white garb was well suited for their message to “travel into eternity,” indeed and “towards the sky” as images of outer space backdropped. In closing, the Thompson Twins minus one twin united with the audience to sing one more with probably their best known anthem, “Stay with Me.” As everyone rose to wave their hands, the chorus felt like a Hare Krishna mantra, bodies swaying in unison and holding all with love. Complete with beehive energy and a glitter in rainbow drapery, the B52s took stage with strobe light glory, encompassed by magical rhythms and playful panache. The scintillating vocals of Kate Pierson with their quintessential high-pitch gleamed like a beautiful banshee, her hair a pink cascade blowing in the wind. Gold sheathed Cindy Wilson on bongos and tambourine, laid more punk layered vocals behind square rimmed pink rhinestoned sunglasses. Percy and Wilson harmonized like nobody’s business in colorful cacophony while Fred Schneider brought his eclectic sound tools and vocal theatrics to the the mic. To say that the B52s put the ‘F’ in “Fun” would put it lightly, their iconic style in both fashion and music have become a mainstay of 80s party life and culture. Their influence is undeniable as their set list contained such hits as “Roam,” “Rock Lobster” and finally “Love Shack.” Unbelievably multifaceted in so many ways, the B52s performed with a virtuosity only limited by gamma rays and amplified by the elegance of the Fabulous Fox. The sophisticated sounds of Culture Club held the crowd captivated as lead singer Boy George implored audience members to “Let Somebody Love You.” While George jokingly acknowledged his cynicism when it comes to love, he coaxed St. Louisans to open their hearts and allow love, all kinds of love. He sang with the same earnest as the young man that first joined up with Culture Club in ‘81, only now with wiser, deeper bodied vocal chords. As the sensational mega band played, the energy inside the Fabulous Fox Theatre became ecstatic, moving with sincere emotion as though taking the audience to interstellar church and beyond. 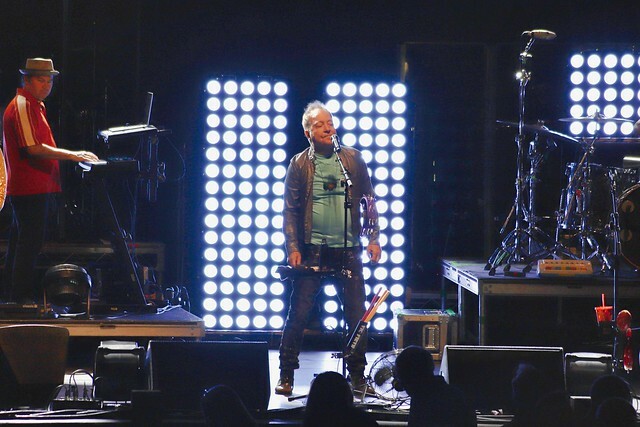 George often highlighted the vocal talent of Culture Club’s backup singers, Mary Pierce, Dee Dee Foster, Karina Fernandez and a promising student he decided should come on tour with them as he urged them to towards the front of the stage. In a flirtatious tease, the crowd cheered for the band to return during a momentary break, rising up to George’s liking for audience participation. While they opened with new classic “Love is Revolution,” a performance by Culture Club would not be complete without “Karma Chameleon” to which the audience sang along with adoration. The Thompson Twins’ Tom Bailey, B52s and Culture Club performed at The Fabulous Fox on September 6, 2018. Check out the KDHX Flickr page for a full set of photos by photographer Gary Eckert.